This is a great off-road option through beautiful scenery. 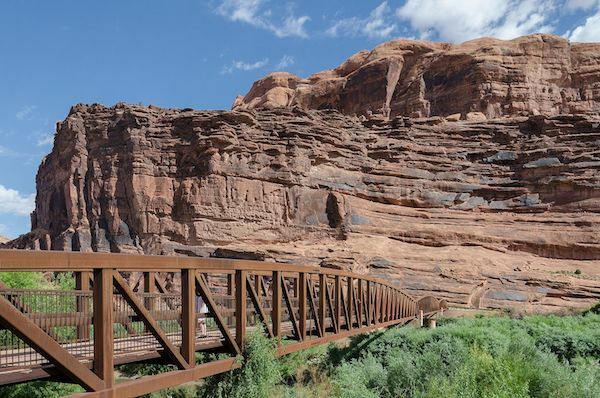 The paved Moab Canyon Pathway parallels Hightway 191 for 8.8 miles, connecting Moab with Arches National Park and Highway 313. For running, we especially like the first 3 miles of the path from the start at the pedestrian/bike bridge that crosses the Colorado River on Highway 128, just north of Moab, to Arches Scenic Drive. This section is also relatively flat. Past the 3-mile mark, the path is a little less scenic, as it runs right along very busy Highway 191, separated only by a concrete barrier. Between miles 4 and 5.5, the path features a fairly steep climb, then flattens out for the final 3 miles to Highway 313. Add-Ons: At mile 3, hop up to Arches Scenic Drive. Beautiful road with fantastic scenery, and an adequate shoulder. At mile 4.6, trail runners can connect to the Sidewinder Trail.